Writer Steven Moffat's commitments to BBC One drama Sherlock will mean fewer Doctor Who episodes in 2012, the channel's controller has said. Danny Cohen told a Derbyshire media conference that Moffat "needs enough time to get that done and then start work on the next series of Doctor Who". That meant there would be "not as many" episodes of Doctor Who, he added. But Moffat later wrote on Twitter that scheduling of Doctor Who had "nothing to do with Sherlock". Doctor Who is one of the BBC's flagship shows. The series typically runs for 13 episodes every year. Last week the BBC announced that they were filming 14 new Doctor Who episodes, including a Christmas special, to be broadcast from next year. But Mr Cohen said that not all of the commissioned stories would be transmitted in 2012. "There will be some episodes, but there won't be a full series, so we won't have a 13-part run," he told the audience at The Church and Media Conference. Mr Moffat is one of BBC One's key writers, who oversees all Doctor Who episodes. He is also one of Sherlock's executive producers, and is currently writing one of the show's three new episodes. "There's only so many hours a day he can be awake," Mr Cohen said, referring to Mr Moffat's workload. "The man has to sleep and eat, and he's got a family." 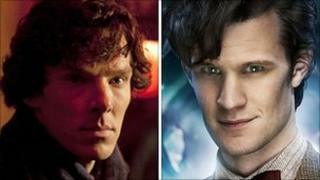 Both programmes attract high viewing figures and between them received five nominations at May's TV Bafta's, with Sherlock winning two prizes. "Steven Moffat is the creative driving force behind Doctor Who. He also, rather magically at the same time, created and got to air Sherlock. So we have to get that balance right," Mr Cohen said. "There'll be more episodes again in 2013, for the 50th anniversary of Doctor Who. So that's a big year." The remaining six episodes of the current series will air on BBC One later this year. Moffat has subsequently tweeted: "The scheduling of Dr Who has got NOTHING to do with Sherlock."